With all of the coverage we've done of ultrabooks in recent months, it's easy to forget that the big vendors are still out there plugging away with more basic, fundamental designs. Intel has expanded the definition of "ultrabook" enough that most consumer-grade systems being made available still fall into those categories, but ultraportables still bear a pretty substantial premium. At the same time, tablets coupled with the persistently dire performance of Atom have turned netbooks into a virtual flash in the pan. There's a gap in the market that vendors like Acer, HP, and ASUS are quietly serving, though. It's clear from the way netbooks took off that consumers are interested in a small, inexpensive, portable notebook with just enough performance, and that's something you're not getting with ultrabooks. As you're going to see today, there's a lot to be gained if you're willing to sacrifice a little bit of Z-height. 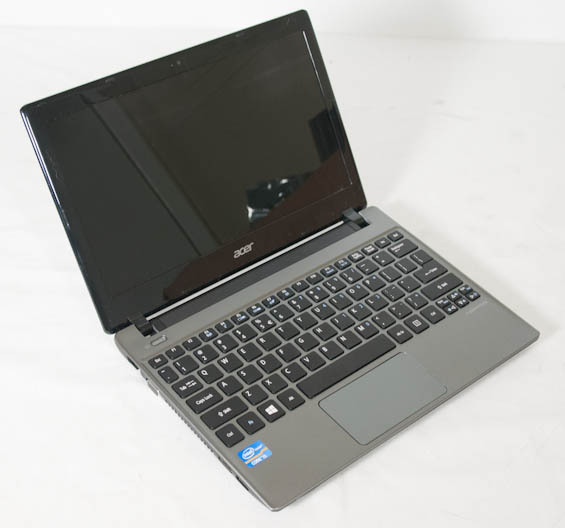 We have the Acer Aspire V5-171 on hand today. Acer is asking just $550 for an 11.6" notebook featuring an Ivy Bridge i5 ULV chip and 6GB of RAM, so what's the catch? As it turns out, there's a little more to today's review than the introduction let on. I was personally looking for a portable notebook to replace my aging Lenovo ThinkPad X100e, something that was still about three pounds but wasn't going to choke if I asked it to play something light like Quake Wars or Duels of the Planeswalkers 2013. Something that could play back the 1080p AVCHD from my video camera when I'm out doing videography, and in a perfect world, something that had Quick Sync. Last generation, Acer had a promising little notebook with a similar shell to the Aspire V5-171 that featured a Sandy Bridge Pentium ULV processor for a little over $400, and that struck me as being a pretty incredible deal for a market that's been forced to deal with overpriced Brazos-based notebooks. Brazos may have a decent GPU on paper, but it's horribly limited by its CPU performance. As it turns out, Acer refreshed that line into the V5-171. Dimensions 11.22" x 7.95" x 0.82-1.09"
What jumped out at me with the Aspire V5-171 is that it's actually a pretty robust machine for the money, and would be considered so even if it were a larger notebook. There are three models in this line readily available in retail; the one we have on hand is the middle model and probably the best deal depending on your perspective. Ours comes with an Intel Core i5-3317U low voltage processor based on Intel's Ivy Bridge architecture, sporting a nominal 1.7GHz clock speed and able to turbo up to 2.6GHz on a single core. It also benefits from Intel's HD 4000 IGP and QuickSync, and I'll talk about just how useful that actually winds up being later on. Attached to the i5-3317U's memory controller is a fairly generous 6GB of DDR3-1333 split into a 2GB DIMM and a 4GB DIMM, and handling storage duties is one of the first places you can really see costs get cut: a pokey 500GB, 5400-RPM mechanical hard disk. Acer opts for a 7mm model to keep the Z-height down, but this is still essentially the weak link. You could argue that the display is also poor, and you'd be correct, but again, this is a budget notebook and the low resolution is more forgivable on an 11.6" panel. Pleasantly, though, Acer shores up connectivity options well. The V5-171 features 802.11b/g/n courtesy of Qualcomm Atheros, Bluetooth 4.0, a gigabit ethernet port, two USB 2.0 ports, a USB 3.0 port, HDMI, and VGA, all alongside an SD card reader. As I mentioned before, there are two models flanking our V5-171-6422 in the market. You can get this notebook at about $100 cheaper if you bump down to a Sandy Bridge i3 and 4GB of RAM. For users that aren't going to need any CPU horsepower and aren't planning on using the IGP much, if at all, the i3 model is certainly a great deal. Losing 2GB of RAM isn't that bad, but I think the Ivy Bridge i5's turbo, increased IPC, and vastly superior IGP are worth the $100 difference. The other flanking model is impossible to recommend, though. Fully $200 more expensive than our review unit, the V5-171-9661 only gets an upgrade to 8GB of DDR3 and an i7-3517U. $200 for 2GB of DDR3, an extra 200MHz on the CPU, and 100MHz on the IGP is a much harder sell than the generational jump you get from going from the Sandy Bridge i3 in the junior model to the Ivy Bridge i5 in our model. The one thing they've all lacked vs my EEE 1005 (premium netbook) is battery life. When it was new I could get 10-13 hours of light use on it, while every non-atom option I've looked at has been done by someone who decided the 5-7 hours of the stock netbook is good enough; draining the 6hr battery on my first netbook semi-regularly was the main reason I paid extra for the 1005 so I rather strongly disagree with that premise. We have the 1810 with Intel Core 2 Solo CPU. For it's age it runs Windows 7 with ease with the stock 3GB of RAM and 250GB HDD. My wife is the primary user but during university I was able to take this on campus and stretch the usage out for a solid 8 hours I actively managed the screen brightness, wifi usage, and the number of applications that I was running. This guy even served as our HTPC for a time and played back 720p content with ease. It looks a reasonably priced piece of kit but I do question its usefulness. I own an Atom notebook. Battery life is around 6 hours. I can surf the web, log into my office and do some work/read emails, play movies and old games. I have had it for 3+ years. I could do all of the above just as well using a tablet and maybe an add on keyboard (sadly I am becoming a fan of the MS design) or a docking station when I will get better screen quality and longer battery life. So an ultrabook has to fill a niche that a tablet cannot. 11.6" mediocre screen on ultrabook versus a 10.6" high quality screen on a tablet is already a win for the tablet at least until you get a 13" screen for an ultrabook. There are only two niches that I can see this sort of ultrabook being useful for - really cheap, substantially undercutting the tablets and secondly for those people on the move that require a lot more power than the tablets provide. For power users on the road, the screen quality and lack of battery life becomes a major issue.